When a team is winning, it is easy to overlook its flaws. With the Mets off to a great start and most players staying healthy, it is hard to look at things from an objective standpoint. With Travis d’Arnaud and Kevin Plawecki on the DL, it is known that catching is not the Mets strongpoint. Many articles have been written on what to do behind the plate. However, first base is also a question mark. Despite the poor offense, Gonzalez has provided a reliable glove. Adrian Gonzalez has gotten off to a weak start. In his first 17 games played, he has slashed .220/.317/.360 with just two homers. This is very bad for a power position. On the plus side, his defense has been really nice as Gonzalez is yet to make an error. This kind of play is reminiscent of James Loney in 2016. Good fielding but light hitting. In today’s hyper-analytical era no team in contention would tolerate this offensive production for a whole season. Here are some options of what the Mets should do. Mets fans love Flores, but hate his glove. If he could just play well enough at one position, he would find himself in the lineup every day and hit over 25 home runs. Sadly, he has been relegated to super utility man. Nevertheless, the data shows that out of all positions, Flores would be fine at first. In 56 games at first in 2016 and 2017, Flores has made just one error. The defensive metrics (Rtot & Rdrs) show that Flores should stay far away from short and third, and that he is an adequate first baseman. He will make some bad plays in the field, but over the course of a full season the bat can make up for it. Wilmer celebrating a game winning home run… but can his glove catch up to his bat? So far, big league life hasn’t been kind to Smith. Despite all the hype, Smith finds himself in AAA after a poor rookie season. He got a suspension for showing up late in spring, which was a bad omen. However, those who follow the 51s likely know that Smith has had a much better batting eye this year. In just 70 plate appearances, Smith has 13 walks. Last year, he had 14 in 183 chances with the Mets. We know that the home run power is there. Could he just need some big league experience to turn out fine? Smith is slimmer and has a better eye at the plate. In 2017, Bruce played a handful of games at first. He did not look sharp. With that said, many have speculated that he will end up there before his three year contract is over. With Cespedes and Conforto in the outfield, the Mets want to figure out how to get Nimmo and Lagares as much time as possible. Nimmo has improved drastically since he first got to the majors and the Mets love his patient approach at the plate. The advantage of putting Bruce at first is that it allows the Mets to put together the best offensive lineup possible and gets Conforto out of center. Bruce crushing the game winner last night. There are still a number of players who haven’t been signed who could help. is probably the best free agent who has played first in the past. While his best days are behind him, he did 50 home runs over the last couple of seasons. If the Mets think that Smith isn’t part of the future, they could try to pluck a guy from a team way out of contention. Two intriguing options are Justin Bour of the Marlins and Jose Abreu of the White Sox. These two teams are ten games below .500 or more, so they may go into seller mode soon. Abreu is earning $13 million this year and has one more year under team control before he becomes a free agent. Being that the White Sox aren’t drawing fans to the park and he is the highest paid batter, they may be open to a trade. Bour on the other hand is making just $3.4 million and is under team control through 2020. The problem is that the Mets may not have the minor league depth for this trade. Would the White Sox want to dump Abreu and his contract? The last option is to just let Gonzalez play it out. Yup, that means do nothing. 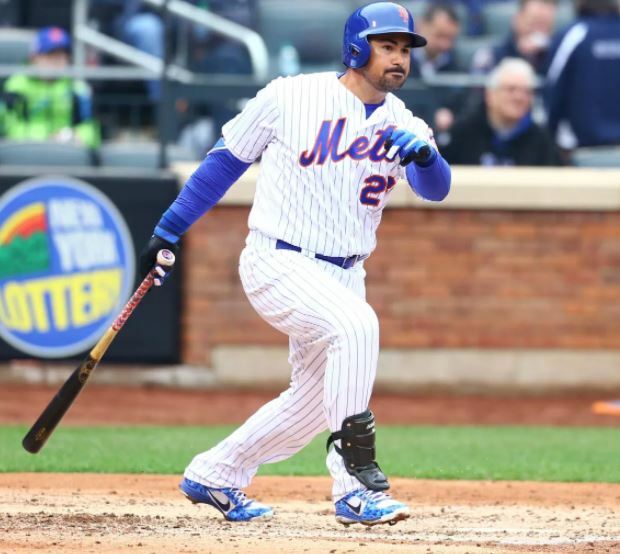 The Mets offense has not gotten hot yet, but that is in part due to the crazy weather. Most games so far have been played under less than ideal conditions. Gonzalez is a tough veteran and as long as he stays healthy, he can figure it out. Besides, he is an excellent defender and is hungry for a championship. The advantage of a nice early season lead is that the Mets can be patient. Let’s see which teams go into seller mode and take advantage when the opportunity comes.